Hide deals from seller "Dreams Tulum Resort & Spa"
Hide deals from category "Resorts"
This offer is valid on a Deals Magazine Discount Voucher only. This Discount Voucher will give you access to the $465 for $1,008 offer for a 3-night stay at Dreams Tulum Resort & Spa. Redemption instructions can be found on Discount Voucher after purchase. The following terms apply to the Dreams Tulum Resort & Spa offer: Limit 1 per person and 1 per transaction. 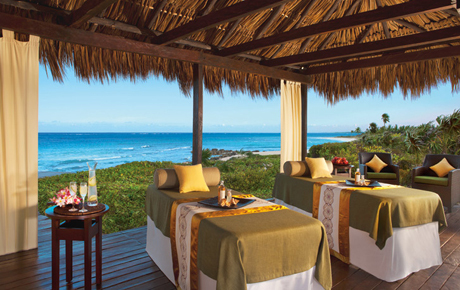 Valid on a 3-night stay at Dreams Tulum Resort & Spa for 1 person in a deluxe garden-view room. Maximum 4 occupants per room; maximum 3 adults per room. All rooms subject to availability. Up to 2 children under 2 stay and eat for free. Meals and beverages at on-site dining establishments included. Charges may be applied for dining at certain restaurants, certain food and beverages, and other amenities outside of all-inclusive package. Airfare not included. Trip must be booked by Dec. 16, 2012. Valid travel dates: 6/6/2012-12/17/2012. Promotional value expires Dec. 16, 2012. Live the dream when you buy a $10 Deals Magazine Discount Voucher worth $543 in savings on an all-inclusive trip to Mexico. With this Discount Voucher, you will get access to 54% off a 3-night stay at Dreams Tulum Resort & Spa in Quintana Roo, Mexico ($1,008 value). Enjoy a deluxe garden-view room for up to four people. Located along the famous Riviera Maya, Dreams Tulum Resort & Spa is a luxurious oasis filled with entertainment, rich history and exciting nightlife. With verdant gardens, white beaches and azure waters, Dreams is the perfect place for a peaceful escape. This all-inclusive resort boasts a variety of activities like kayaking, windsurfing and deep-sea fishing, and guests are just minutes away from Mayan ruins and Xel Ha Water Park as well as the luxury shopping and nightlife of Playa del Carmen. Dare to dream with this exciting deal. Resort and spa in Quintana Roo, Mexico, offering all-inclusive vacations for families, couples and more. Once purchased, your Discount Voucher will provide information on how to redeem at $465 for $1,008 offer to Dreams Tulum Resort & Spa in Quintana Roo, Mexico.